Q&A: How can I add a 2nd monitor to my computer when it has just one VGA port? Question from Mickey W.: Hi Rick. I have an Acer desktop computer running Windows 7 Home Premium. I want to add a 2nd monitor just to display my Gmail window. The problem is this computer has just one video output port (it’s VGA). Can I buy something like a splitter that’ll let me hook up two monitors to one video port? I’d really like to have my Gmail open and in view at all times. Thanks in advance for your help. Rick’s answer: Mickey, you could indeed add a second monitor to your computer by using a splitter, but the result wouldn’t be what you’re after. Since both monitors would be sharing a single VGA port, they would both display the same exact image. This could be useful if you wanted to duplicate the image onto a projector, but other than that it would likely be pointless. 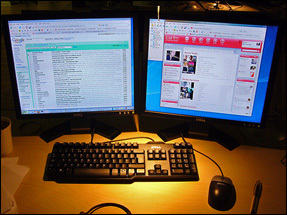 1 – You can add an extra video card that supports multiple monitors to your PC and then connect one or more additional monitors, each of which can display their own image. You didn’t mention the model number of your Acer desktop, but since it’s running Windows 7 I’m guessing that it isn’t ancient, which is a good thing. What you need to do is look up the specs for your PC’s model number and see what kind of open expansion slot it has available. Then purchase a video card that’ll work in that slot. You’ll find an excellent selection of video cards on Amazon, and you really don’t need an expensive one for what you intend to use it for. Click here to check them out. 2 – If you would rather not open up your PC and mess with its innards, you can add an extra video port by simply plugging in an inexpensive USB video adapter . These adapters are extremely easy to install (just plug the adapter into an open USB port and install the driver). They are also very inexpensive and work quite well. You’ll find a large selection of USB video adapters on Amazon. Click here to check them out. I hope this helps Mickey. Good luck! Bonus tip: This post explains how to add a Gigabit Ethernet adapter to your PC without even opening the case!